If you like tender, juicy rotisserie chicken, you won't be able to get enough of this Instant Pot whole chicken. 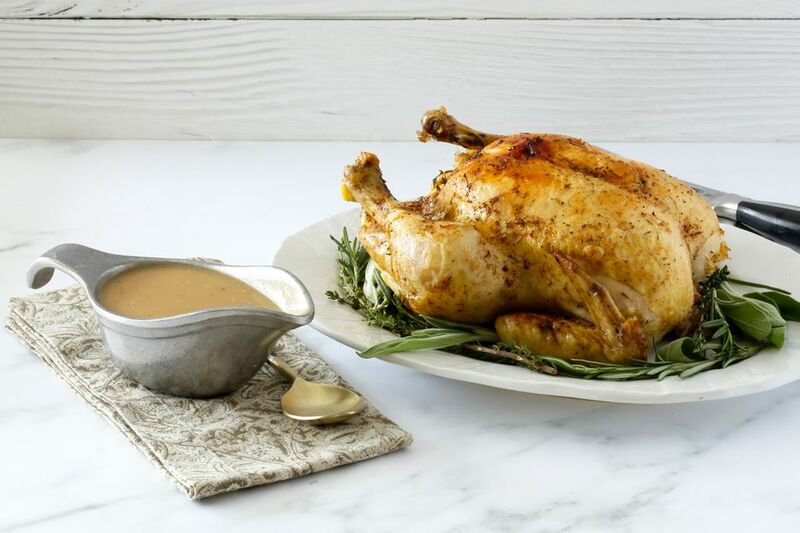 The bird is perfectly cooked with a combination of rotisserie-style spices in just 30 minutes—allow about 10 to 15 minutes for pressure buildup and another 12 minutes for natural release, and it's ready! Serve the chicken as a main entree with the optional gravy or use it as an ingredient in other dishes. The chicken makes wonderful sandwiches with or without the sauce. Or chop it and use it to make chicken salad. A homemade chicken pot pie is another excellent option, or use diced-ups pieces in your family's favorite casserole. If you have another spice mixture you like, feel free to use that instead of the included rotisserie-style spice blend. Try a Cajun or Creole seasoning blend or a rub blend made for poultry. Pat the chicken dry with paper towels. Remove the innards from the cavity and discard or freeze for another use, such as chicken stock. Peel the onion and cut it into quarters. Cut the lemon into quarters. Put the onion and lemon pieces in the chicken cavity along with several sprigs of herbs, if desired. Combine the paprika, onion and garlic powders, thyme, pepper, and salt. Mix well and rub over the chicken. Place the Instant Pot trivet in the pot and add 1 cup of chicken stock. Place the chicken on the trivet in the Instant Pot. Lock the lid in place and choose either the poultry or manual setting and high pressure. Make sure the venting knob is turned to "sealing." Set the time to 30 minutes for a 5-pound chicken. For other sizes, calculate 6 minutes per pound. When the time is up, let the pressure release naturally for 15 minutes. If the chicken was defrosted, it should be perfectly done. If in doubt, check it with an instant-read thermometer. It should register at least 165 F in the thickest part of a thigh (not touching bone). If it isn't quite to temperature, leave it on warm and place the lid back on the pot. Check the temperature again in about 5 to 10 minutes. For crispier skin, transfer the chicken to a baking pan and place it under a preheated broiler for a few minutes, or until browned. Use the chicken for sandwiches or casseroles or serve it along with the optional gravy. Strain the liquids left from the chicken into a fat separator or strain them into a cup and skim off any excess fat. You should have about 1 1/2 cups. Set aside. Add the butter to the Instant Pot and select the sauté setting. When the butter is hot and bubbling, add the flour. Continue cooking, stirring, for 2 minutes. Gradually add the defatted liquids and continue cooking for 2 minutes longer, or until thickened. Taste and season with salt and pepper. For a frozen chicken, add about 5 minutes per pound. Also, plan for extra time for a frozen chicken to come to pressure as it will take about double the normal time. A 6-quart Instant Pot easily accommodates a whole 5-pound—or slightly larger—chicken.